See in Glossary that have a Network Identity component. These scripts can perform high-level API functions such as Commands, ClientRPCs, SyncEvents and SyncVars. 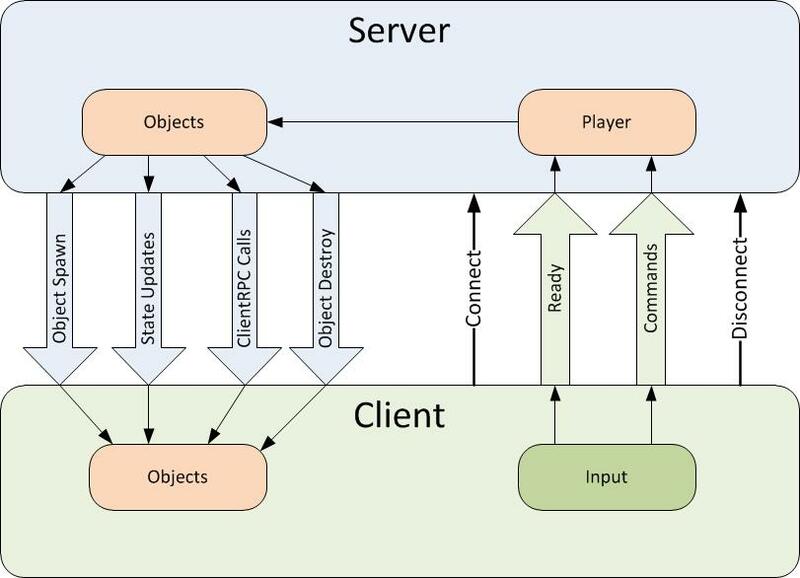 With the server-authoritative system of the Unity Network System, the server must use the NetworkServer.Spawn function to spawn GameObjects with Network Identity components. Spawning them this way assigns them a NetworkInstanceId and creates them on clients connected to the server. Note: This is not a component that you can add to a GameObject directly. Instead, you must create a script which inherits from NetworkBehaviour (instead of the default MonoBehaviour), then you can add your script as a component to a GameObject. isLocalPlayer Returns true if this GameObject is the one that represents the player on the local client. isServer Returns true if this GameObject is running on the server, and has been spawned. isClient Returns true if this GameObject is on the client and has been spawned by the server. See in Glossary is true, the authority rests with that player’s client, and this value is true on that client instead of on the server. netId The unique network ID of this GameObject. The server assigns this at runtime. It is unique for all GameObjects in that network session. playerControllerId The ID of the player associated with this NetworkBehaviour script. This is only valid if the object is a local player. See in Glossary on the client. connectionToClient The NetworkConnection associated with the Network Identity component attached to this GameObject. This is only valid for player GameObjects on the server. localPlayerAuthority This value is set on the Network Identity component and is accessible from the NetworkBehaviour script for convenient access in scripts. You can synchronize member variables of NetworkBehaviour scripts from the server to clients. The server is authoritative in this system, so synchronization only takes place in the direction of server to client. Use the SyncVar attribute to tag member variables as synchronized. Synchronized variables can be any basic type (bool, byte, sbyte, char, decimal, double, float, int, uint, long, ulong, short, ushort, string), but not classes, lists, or other collections. When the value of a SyncVar changes on the server, the server automatically sends the new value to all ready clients in the game, and updates the corresponding SyncVar values on those clients. When GameObjects spawn, they are created on the client with the latest state of all SyncVar attributes from the server. Note: To make a request from a client to the server, you need to use commands, not synchronized variables. See documentation on Sending commands for more information. Note that in a peer-hosted setup, when one of the clients is acting as both host and client, both OnStartServer and OnStartClient are called on the same GameObject. Both these functions are useful for actions that are specific to either the client or server, such as suppressing effects on a server, or setting up client-side events. [Server] and [ServerCallback] return immediately if the client is not active. Likewise, [Client] and [ClientCallback] return immediately if the server is not active. The [Server] and [Client] attributes are for your own custom callback functions. They do not generate compile time errors, but they do emit a warning log message if called in the wrong scope. The [ServerCallback] and [ClientCallback] attributes are for built-in callback functions that are called automatically by Unity. These attributes do not cause a warning to be generated. To execute code on the server, you must use commands. The high-level API is a server-authoritative system, so commands are the only way for a client to trigger some code on the server. Only player GameObjects can send commands. When client player GameObject sends a command, that command runs on the corresponding player GameObject on the server. This routing happens automatically, so it is impossible for a client to send a command for a different player. Commands are called just by invoking the function normally on the client. Instead of the command function running on the client, it is automatically invoked on the corresponding player GameObject on the server. Commands are type-safe, have built-in security and routing to the player, and use an efficient serialization mechanism for the arguments to make calling them fast. Client RPC calls are a way for server GameObjects to make things happen on client GameObjects. Client RPC calls are not restricted to player GameObjects, and may be called on any GameObject with a Network Identity component. Networked events are like Client RPC calls, but instead of calling a function on the GameObject, they trigger Events instead. This allows you to write scripts which can register for a callback when an event is triggered. You can use events to build powerful networked game systems that can be extended by other scripts. This example shows how an effect script on the client can respond to events generated by a combat script on the server.